Believe it or not, MPZ has been going for 7 years as of tomorrow (28th of April) And I want to thank you all for continuing to support this silly little site. 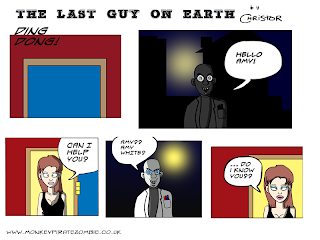 To mark the occasion I have produced a comic story much longer than i ahve attempted on the site before. The comics section has largely been limited to single panel cartoons, but this is a veritable epic at 10 pages. Hopefully this will be the first of many 'proper' comics that I will bring to the site. I used to produce comics all the time, but I pretty much dropped them when I stated to make animations. Since then I have been meaning to get back in to it, but somehow have never quite managed it. Until now. I have also reuploaded a bunch of comics I drew last year which you can see in the posts below this one.